The White Rooms is a work of science fiction/horror, or dark science fiction, which portrays the results of the transformation of human society in the future under the pressure of a plague of disease-carrying spiders of enhanced intelligence and malevolence – which have arisen out of some kind of genetic engineering disaster. So this could be seen as a so-called "post-apocalyptic" or "post-catastrophe" story. Two of the best known examples of this subgenre in pop-culture can be seen in the second and third Mad Max movies. 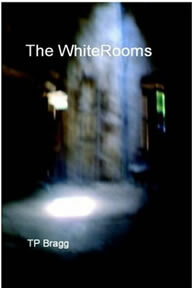 The White Rooms portrays human society in a very "stressed" situation. Indeed, the "world" portrayed in the novel is quite gruesome, as well as having elements of the subgenre of "steampunk" or "dark steampunk" – where much of the technology has regressed to an approximately early industrial age level. In that part of the Earth where the protagonist lives, human society has bifurcated into a zone inhabited by "Uppers" – those humans who have access to the anti-plague serum – and a zone inhabited by "subs" – who are mostly kept out of the Upper zone, and mostly left to the ravages of the plague. Life is nevertheless none too happy for the "Uppers" – as even in their supposed safe zone, they have to constantly be on the lookout for encroaching spiders – who are kept at bay with the assistance of "helpers" – i.e., healthy subs who are permitted to live as slaves among the Uppers. The Uppers have a shrinking birthrate, and they bring healthy sub children to the so-called "White Rooms." The term has various, more sinister meanings in that world as well. Apart from being an interesting exploration of what the impact of a catastrophic plague might be on human society, the book also offers an exciting action-adventure story. There are probably two main attractions to the book. One is the careful working out of the various implications of a "post-apocalyptic" future of a genetic engineering/medical disaster, which will appeal to those with a taste for the baroque, gothic, or bizarre. It is somewhat similar to some of the writings of the well-acclaimed author of the fantastic, China Mieville. Secondly, there is the sprightly action-adventure tale, which is set in motion by the limitlessly self-sacrificing love of a young woman from the sub zone for her infant son, whom she wishes to somehow place among an Upper family, to give him the prospect of a better life. The woman has through arduous struggle managed to keep herself free of the disease. Working as a helper in his household, she draws in the protagonist of the story, an Upper whose own wife is pregnant. The use of the first-person narrative (apart from a few select chapters in the third-person) is an excellent idea for the book, which really catches the attention of the reader. During one of his trips to the sub zone, the protagonist is unluckily bitten by a spider, and, becoming infected, he must take ever more extreme measures to extricate himself from a situation which is perilous not only because he has the disease, but because of how the Upper society handles those who are infected with that plague. As the protagonist is faced with ever greater problems and challenges, he moves ever further away from the values of the Uppers. In the reviewer's opinion, there are at least three main weaknesses to the book. First of all – at least as far as the reviewer has been able to determine -- there are not enough clues given in the story as to where on the Earth it is taking place. It is not set far enough in the future that there have been huge geological changes, so the reader should be able to eventually figure out whether this story is set, for example, in what was formerly France and Spain, in what was formerly America, or maybe entirely in the former Great Britain. Secondly, there was the lack of originality in the naming of characters – where more specific names might have more easily engaged the reader and avoided such dreadful clichés -- as calling the protagonist "Adam X" for example, and another major adult character, "Johnny". Thirdly, the presence of the disease-free land to the south-west, may seem too contrived. Would the spiders have necessarily been effectively blocked just by a quick-running river, as the author implies? Much of the author's effort put into the construction of a grim but coherent background was thrown away by this "sanctuary" trope. It should be pointed out that, because human society is shown as so enormously "stressed" by the surrounding environment in the author's scenario, the possible political import of the story as far as specific, current-day social and cultural situations is rather small. For example, the names of countries known today have apparently been entirely forgotten, along with all current-day religions (except for some vestigial cultural residues). The broader messages of the book, however, would appear to be -- better freedom in material discomfort than subjection in material comfort -- as well as -- true freedom is well worth winning -- and the emphasis on the need for active courage in the face of evil -- which, while not new ideas, are things which it is helpful to repeat today.